Although most think tanks in India claim to be non-partisan, many are working as national foundations or trusts in the name of national leaders, ostensibly to consolidate their legacy and to promote their vision of India through research or by promoting scholarships for higher education. University faculty are on the Boards of think tanks or are part of the Research Advisory Committees (RAC) of think tanks and collaborate on joint research papers (the research or academic output of think tanks). Universities support training and capacity building activities for think tanks. Universities engage with think tanks on policy advocacy activities. Think tanks invite experts from academic institutions to share knowledge and understand trends from an academic perspective. Furthermore, the relationship between the State and think tanks in India is based on contingent collaboration, where think tanks rely heavily on the use of infrastructural power of the State. However, many think tanks have managed to retain a great degree of operative freedom and are largely autonomous. The infrastructural power of the Indian state is more evident in the case of think tanks concerned with international economy, trade, military and security issues, where some of these organisations come directly from a ministry and have ministers and secretaries as ex officio Board members. The strong infrastructural power of the State has been able to keep the influence of international agencies at bay or functioning under the framework dictated by the State. In this context, the environment into which a think tank is born is different from its counterparts in developed countries. 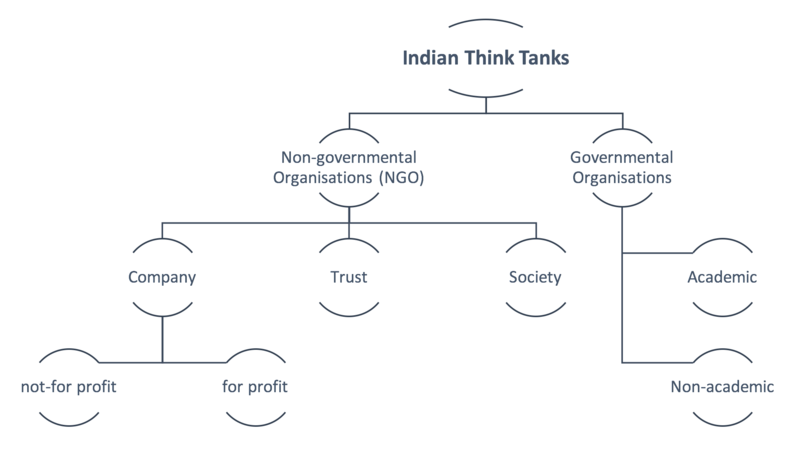 The funding mechanisms, laws and regulations, and other governing principles are all determining factors not only on the operational front but also in view of how an organisation is going to function, its research mission and, by extension, its core vision.+ I have found that very few research organisations in India call themselves ‘think tanks’, regardless of the fact that their work contributes significantly to the country’s policymaking process. 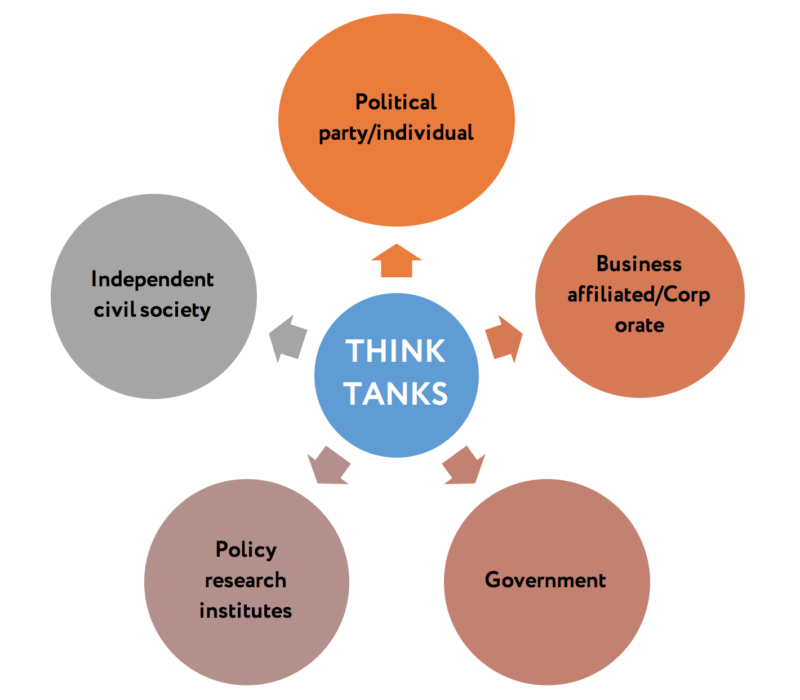 Think tanks in India have a few distinctive characteristics: they work on different models, and they bracket themselves as government, non-government, civil society organisation, or think tank. Non-governmental and governmental organisations have more or less an equal share of the pie in the Indian think tank ecosystem. Governmental organisations are those which are completely or partially funded by the government. They also include organisations set up by Ministries and public or private foundations, all of which function autonomously. Educational research institutions affiliated or certified by governing councils, like the Indian Council of Social Science Research (ICSSR), form the academic part of the typology. This list also includes organisations which are set up as a part of collaborative efforts by the central or state government with an international organisation. Non-governmental organisation (NGO) is the most popular term of identification used by Indian think tanks. An NGO can be registered as a company, a society or as a trust. Separate regulations and laws govern each due to differences in funding mechanisms, governing structure, tax laws and the degree of transparency required. NGOs are further differentiated as either not-for-profit or for-profit. The former type is more common, due to tax exemptions and a sense of credibility that a not-for-profit status conveys. In India, there are differences in the level of influence think tanks exercise in creating alternative discourses. However, there is general acknowledgement that the growing number of think tanks strengthens India’s strategic discourse and thus increases the quality and effectiveness of the policymaking process. Have you conducted research on Indian think tanks and have an opinion on their affiliations and how they can be classified? Drop us line!